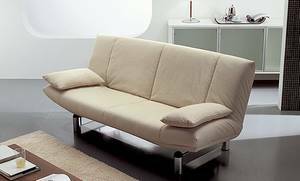 Description A cool, modern sofa design that transforms into a bed by the simple movement of lowering the back. Features a strong metal frame with springing provided by electro-welded mesh. Fully removable fabric covers in a variety of colours. Cushions available to purchase seperately.